Published by Merrion Press, 2015. Though Arthur Griffith has been the subject of recent studies of specific aspects of his life and career, Owen McGee’s Arthur Griffith comes to shelves as the first comprehensive biography in nearly 20 years of this pivotal figure of the revolutionary period. Given this lack of availability of works on the Sinn Féin founder on bookshelves (only Anthony Jordon’s recent comparative study of Griffith with Yeats and Joyce comes to mind), this particular book comes with a great weight of expectation. Given this lack of availability of works on the Sinn Féin founder on bookshelves, this particular book comes with a great weight of expectation. The book’s strongest section is in these first few chapters, as McGee expertly traces the development of Griffith’s political thought as he navigated through the cultural and literary societies of Dublin in the late 19th/early 20th century. In one noted departure from previous biographies of Griffith, (particularly those by Calton Younger and Brian Maye), McGee draws from available sources to de-emphasize the notion of any youthful hero worship on Griffith’s part of the Irish Parliamentary Party leader, Charles Stewart Parnell. The book’s strongest section is in these first few chapters, as McGee expertly traces the development of Griffith’s political thought in the late 19th/early 20th century. In this period, Griffith comes into contact with many figures who would have a profound impact on him, including John O’Leary, Maud Gonne, John MacBride, and of course, his great friend and collaborator, William Rooney. The advanced nationalist response to the Boer War of 1899 – 1902 is depicted as having had a radicalizing effect on Griffith, not to mention his deeply convoluted dealings with the Irish Republican Brotherhood and their influence on his career as a journalist. (Given the uncertainty of when Griffith left the IRB, McGee posits the intriguing notion that this could suggest Griffith never left it at all). What becomes clear however as one progresses through the book is that this is very much intended as a political biography of it’s subject, with details on more personal aspects of Griffith’s life – such as his marriage to Maud Sheehan – often disappointingly confined to the sometimes lengthy footnotes. Some of these are as fascinating and illuminating as anything in the main text, particularly the influence of Griffith’s working class background and relationship with his family members. (Rarely do authors mention how his father ended up in a workhouse and its effect on Griffith). Some of the more common historical debates around Griffith are also to be found in the footnotes, such as the allegations of Griffith being prone to anti-Semitism in his writings. Perhaps McGee felt the debate on Griffith’s alleged anti-Seminitism – discussed at length in Brian Maye’s 1997 biography – was a bit worn out, but the exclusion of his own thoughts on this contested subject from the main text is disappointing. As the narrative rolls into the 1916 Rising, one also gets the impression one is less reading a biography and more of an alternate thesis on the entire revolutionary period, with asides on Griffith interspersed in the text from time to time. For instance, from this juncture in the narrative McGee seems increasingly fond of giving blindsides to the reader of the revolutionary period; featuring rather unique perspectives and commentary on familiar personalities and events in this period that will surprise many. One idea that recurs in the text and footnotes is the suggestion Maude Gonne was a British spy. As the reader moves beyond the 1916 Rising this tendency of the book for McGee to challenge accepted ideas about the revolutionary period becomes more apparent, to the point one can get the sense it’s central subject can become more then a little lost. This is a problem for a biography, as important as it may seem to detail aspects of the Irish economy and Catholic Church in this period. This approach is seen most clearly in the section dealing with the events of the Irish Civil War, which surprisingly does not venture into overt details on the Treaty negotiations or the subsequent descent into militancy on both sides, or into the heated debate which Griffith played a part in. For instance, McGee dismisses the anti-Treaty republicans as more focused on setting up a trade union for Volunteer members in April 1922, and suggests the term ‘IRA’ was first adopted by Volunteers only then. Certainly a detail most historians of the period would take issue with. McGee then strangely sums up the Irish Civil War as “essentially an economic fall-out from business and banking leaders’ extant commitment to the Government of Ireland Act… “ (page 345). This is in keeping with a theme in the book to which the writer frequently returns, that British policy towards Ireland in this period was geared towards keeping a firm economic influence on the island by way of partition. In this respect the book’s treatment of Eamon de Valera may prove to be particularly controversial, implying de Valera’s opposition to the Treaty was mainly due to this, having foreseen the Treaty split long before the document’s signing. To McGee’s credit he does frequently back-up this recurring theme with an array of sources and ties it into conclusions he makes on Griffith’s life and legacy, though one cannot help but wonder if the author might have been better writing it into an alternate thesis on the revolutionary period instead of at the expense of increasingly detracting from it’s main subject in the closing chapters. As a result, understanding Griffith’s role in these tumultuous years becomes a little difficult to understand as the book spins out in other directions, disappointing given the strength of the earlier chapters and how they illuminate Griffith’s early life and political development. The writer also betrays something of an axe to grind in the book’s lengthy conclusion, which becomes at times fiery, and sometimes near-unreadable treatise on Irish historiography on the period. Certain contemporary historians, often on opposite ends of heated public debates, may find themselves greatly surprised who they are grouped with. One example being in the footnotes McGee suggesting historian John Regan takes his research into the civil war from the lead of Erskine Childers’ propaganda of the period, which even Regan’s fiercest detractors may deem too dismissive and not dealing with the issues Regan raises in his research. Owen McGee’s Arthur Griffith is a fascinating, if at times greatly frustrating, work. While on occasion the points McGee makes in this concluding section can be interesting even if the reader does not fully agree, it is finally (if awkwardly) tied into a concluding – though valid – point on how elusive Griffith remains as a historical subject for would-be biographers. On this point, those interested in the period and Arthur Griffith should be thankful Owen McGee’s fascinating, if at times greatly frustrating, work helps to begin to redress this balance. 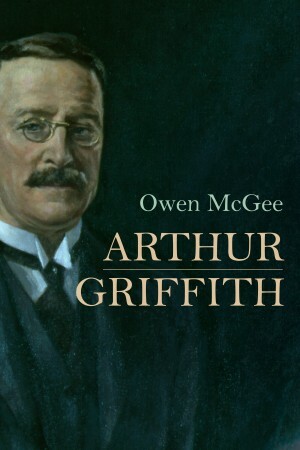 Given the lack of recent biographical works on Griffith, it will be intriguing to see if Owen McGee’s book begins a trend of other works on the Sinn Fein founder as we head towards the centenary of Griffith’s death in 2022. Many may rightly dispute Owen McGee’s views on the Irish revolutionary period and wider Irish historiography, yet what he reveals of Griffith’s politics and career should prove more than enough to contribute to what could prove to be an increased debate on the life of this divisive figure. Gerard Shannon is a member of Skerries Historical Society. He has written two previous articles on Arthur Griffith for this website here and here. 13 Responses to "Book Review: Arthur Griffith"
Thank you for general review , raising great points on the real Arthur Griffiths. My only concern is the Griffith being anti Semitic. This has no bearing as it was widespread throughout Europe etc. This discredits him to a degree and publiciy the anti sympathetic promoters. Hi Joe, the writer of the review here. I totally agree with you that it’s a bit simplistic to dismiss Griffith was outright anti-Semitic; the notion appears to come from a period where Griffith was commenting on the Limerick Boycott of 1904. When McGee does contexualise Griffith’s writings on this in his footnotes, I’d direct your attention to Brian Maye’s 1997 biography of Griffith (in most libraries) that tackles this historical controversy a bit more substantially. There was no excusing – then or now – what Griffith wrote on certain subjects related to those of the Jewish community but it’s good to read what other historians have written on the subject. It’s not something I have researched myself. An interesting, if surprising, review. Some brief comments from the author, if I may. First, my Griffith book is a historical biography that places the focus at all times on what Griffith said and did, and most of the time he did that in print. All the debates in the book centre upon what Griffith wrote and those debates that he himself took part in, but they are largely forgotten now and are evidently partly unfamiliar even to the reviewer. Second, what you refer to as a “near unreadable treatise on Irish historiography” is a conclusion that places emphasis upon the history of Dail Eireann and the absence of a historiography of that assembly and, partly as a result, of Griffith and his cohorts. There would have been no Irish revolution without the Dail, which was the basis of the demand for full self-determination (including a republican demand and the right of Ireland to have its own police and army), and it was the fate of the Dail (which had very little money and the existence of which was opposed by the old Irish Party, not just “the unionists”) that determined the final stages of Griffith’s career. He died before what people refer to as “civil war politics” really took off (or became something definable) but unfortunately a lot of people are incapable of viewing Irish history (including the history of the old Irish Party and Sinn Fein) outside the prism of civil war politics post-1922! You are right to note that I included quite a lot of subsidiary information in the footnotes. That was done precisely to avoid having that in the text and so diverting attention away from the biographical subject of Griffith! Also, in the footnotes are the origins of some of the terminology you refer to, although I did not write at length on that subject, which I could do if I wished. If you are interested in that subject, I also wrote a book on the IRB, which covers some of the basic groundwork, and it is a subject upon which I may write in more detail at a later date. One point that is worth remembering, though. The whole issue of employing volunteers formally as the police and army of the Dail became central during 1922; hence Harry Boland’s initiative, nominally on behalf of the IRB, in founding an IRA Organisation in March to champion that idea. The IRA Army Council, however, was not instituted as a distinct organisation until October 1922 (by which time Boland was long dead and the IRB had ceased to meet) and it formally renounced its allegiance to the Dail by declaring itself a totally independent movement and a government in itself. Excepting Liam Lynch, it also consisted of no ex-IRB personnel. A question for historians to consider in that context is what purpose an Irish republican army should have (or could possibly have) served other than in sustaining the Dail? An army can’t exist without a government to serve. Who did the IRA Army Council think they were serving? p.s. on the ‘anti-Semite’ front: Griffith was actually accused by the Irish Party on occasion of being “in the pay of the Jews” because he was considered to be a fellow political traveller with William O’Brien MP, who was married to a rich Jew and had his own party, and several of Griffith’s friends were Jews. The great extent to which the Irish Party hated Griffith and, in turn, the extent to which the Irish Party has been made central to a historiography of Irish nationalism, “may” have played a part in preventing people from seeing “the wood from the trees” as regards Griffith’s career, in this and in many other (much more) significant matters. In terms of historiography, that is an interesting subject in itself (it has even affected understanding of figures like O’Brien; e.g. the Irish Party would never have achieved the balance of power in the House of Commons in 1910 without O’Brien’s 11 MPs, but who ever refers to this fact?) that I had to treat, to some extent, in the book’s conclusion. In addition, everyone has, I presume, either heard or read people talking about “Redmondism” (an “ism” about a man who died in 1918) or “Parnellism” (an “ism” about a man who died in 1891) and, I guess one could say, republicanism as defined by An Phoblacht (an “ism” launched in April 1923), but why do so little of those people who profess to be interested in Irish history pre-1922 ever speak about the history of the Dail (founded in 1919)? Has ideology taken the place of historical studies? Now, there’s some food for thought! p.s. no 2: as featured in the book’s footnotes, Maud Griffith stated regarding her husband to the Bureau of Military History that “he was a member of the IRB”. She did not say that he ever left that organisation. That is why I left that question open, apart from the fact that he certainly remained closely associated with IRB members to the end of his life. Brief comments? I’d hate to see your long-winded comments Owen. I would guess that this is to do with the intended subtext between republicanism and so-called constitutional activity. This, of course, is to entirely ignore the ‘slightly constitutional’ political activities of much of the careers of O’Connell, Parnell and Redmond. p.s. to Owen McGee: I do have some burning questions about Fred Allan, Jim Stritch, the Sheehan brothers and other I.R.B. men associated with Dublin Corporation, if you have the time to graciously answer (a busy year, I know). Wow, think I agree with John (however he ment it in jest) on stretching the definition of ‘brief comments’ there Owen! I am very anxious not to repeat myself too much and go off on tangents from what we’re discussing here – the book’s worth as a biography of Griffith – as much of what you say I already dealt with in the review in terms of how it is presented in the book; particularly your comments on the historiography of the period. I do appreciate that in mentioning the debates of the time there is an effort to place it in context of what Griffith said, though I again do stress I do not feel at times it was an entirely successful approach, because at times Griffith himself does feel a little lost in certain parts of the main text. On these points, we’ll agree to disagree. 1) I find it a strange statement saying Griffith was not a part of “civil war politics” and this is not a lazy idea reflected through the prism of said politics. As leader of the Dáil cabinet, in conjunction with the Provisional Government through 1922 Griffith in a huge way helped to set the tone and debate for the pro-Treaty side as it’s public face all the way to civil war’s outbreak, which was inevitable given he was the first signatory of the Treaty and a contributor to the subsequent debates (some contemporary commentators even saying Griffith gave the best contribution in support of the Treaty). Griffith was a proponent of the the National Army’s attack on the Four Courts even if he was not the one who instigated it (even if he could), as well as wanting action on the IRA units in Limerick city several months before, and was furious when the (temporary) truce developed there. His influence was definitely on the wane from April thereabouts as Collins increasingly asserted himself and the Dail stopped meeting as a separate cabinet to the PG, though a lack of influence on Griffith’s part was inevitable given his increasingly serious health issues. 2) I am familiar with Maud Griffith’s BMH Statement though it’s certainly just a passing comment on her husband’s IRB membership, in what is already a brief piece in which I think you’ll agree she glosses over other important aspects of her husband’s life. (Though not surprising given they seemed to rarely discuss politics in their marriage, which like other authors you note in your book). Griffith’s friend George Lyons in his own BMH Statement puts forward a likely scenario – involving Fred Allen, or at least allies of his – that may have lead to Griffith’s formal parting with the IRB that I’ve never seen mentioned in other works. Boo! I suppose the ‘long-winded comments’ remark is intended as a good natured joke. Suffice to say such comments can only be a “tip of an iceberg” of how many research questions could and really should be pursued! As to the “slightly constitutional” phrase: that is one that is most commonly associated with Sean Lemass in 1927 and what did it mean? I would say that it meant that the issue of creating an Irish constitution was a longstanding debate, and, by 1927, was still even considered to be an unsettled question to many. The phrase “slightly constitutional” in itself doesn’t mean anything, though. If one can say that the phrase dated from 1927, an interesting thing in that context is that “some” recent research has suggested that DeValera was in and around the mid-1920s already talking with constitutional lawyers about reforming the Free State constitution. His idea in late 1922 – a ‘Council of State’ (which couldn’t really be said to exist then, although I catalogued its surviving papers as part of the Art O’Brien papers in the NLI) – later resurfaced in Bunreacht na hEireann, so I guess that is an aspect of what might be typified as truly Irish constitutional history (i.e. ever since there was a written Irish constitution, in 1922) that deserves more research in the future as part of historical research upon the birth and evolution of Dail Eireann, if Irish historians are going to begin interesting themselves in such subjects. I have recently encountered an argument online (from a Fine Gaeler in the media) that the present state in the 26 counties is ‘Treaty-based’, a line of reasoning that I’d have issues with accepting, given FF’s deliberate undermining of the Treaty from the day they assumed power, culminating with the ’37 constitution, and the certainly provocative (and extra-Treaty) claims to the remaining six counties. Jim Stritch: I have suspicions that the I.R.B. may have been engaging in sleight-of-hand when they sold the old National Club (i.e. No. 41 Parnell/Rutland Square) to the Irish National Foresters at the turn of the previous century. It certainly appears to have continued as the epicentre of I.R.B. activities up until the Rising (the I.R.B. drilling in the Foresters’ Hall at the back is well-known, of course). I have a suspicion that Jim Stritch (MacBride, as well) was part of the I.V. Auxiliary who mobilised at No. 41 under J.R. Reynolds on Easter Monday. I know that Stritch is on the G.P.O. roll of honour, and was picked up by the British after the Rising and deported, but there’re no other clues that I can find. His WoI activities are a mystery, too. There are newspaper reports in later years, when the Wolfe Tone monument was finally being built, to Stritch’s stewardship of the I.R.B. funds – the only clue I can find as to how it was done, though, is the extensive list of properties which was disposed off in his will (he died a childless windower, as far as I can tell). Fred Allan: I’ve read plenty of references to his having been against the Rising, but frustratingly no-one ever gives a source for this statement. There are a number of BMH witness statements, however, claiming that his National Volunteers at kingstown (and Tom Cullen’s at Pembroke St.) were ready to join in the Rising, having been in contact with Éamonn Ceannt (probably by way of Major MacBride), on the delivery of arms from the Aud. Have you heard anything of this? Ted (Timothy) J. Sheehan and William Sheehan both appear to have been well-known Irish Volunteers in Dublin – and I strongly suspect I.R.B. as well. T.J. Sheehan had been a SF councillor in the city, and Bill Sheehan an employee of Dublin Corporation’s electrical department. From BMH witness statements, both (and a sister who may have been Cumann na mBán) were heavily involved in the planning and preparations for the Rising. Ted was supposed to be in charge of seizing the Central Exchange, and Bill to blow the bridges on the Northside. Yet on the Monday mobilisation both simply go to ground (after disposing of the gelignite meant for the bridges) and never crop up again in the revolutionary years. Neither one is deported or even arrested after the Rising, that I can discover. It’s perplexing and there clearly was a story here – the only clue is a mention in an MSPC statement, and I paraphrase, that “I suppose Ted Sheehan isn’t available” (as a reference). I have a working theory that these pair are part of the reason for post-Rising bitterness among I.V. towards the I.R.B., but no real proof. Clearly something happened – their desertion was disastrous to the military prospects of the Rising – but nobody’s talking about what happened next – I.V. or I.R.B. court-martials at least, I presume (I do know that Bill Sheehan’s still among the living in 1928, when he gets a promotion in the Corpo). And… that’s just the start. Very frustratingly, neither P.T. Daly and Henry Dixon wrote their promised memoirs, and none of the older senior I.R.B. men gave BMH statements or made pension applications. For all we might wish otherwise! To Gerard Shannon: I would not agree with your comments regarding Griffith and the Volunteers/IRA in 1922 because on that subject I relied on the minutes of the Dail cabinet in the National Archives; meetings that Griffith chaired. In all instances, he was supportive of the idea of the army unity negotiations. That is also indicated by Boland’s (essentially IRB) correspondence, which was kept under lock and key for 75 years in DeValera’s private papers. Griffith’s response to the British demand to take action on the Four Courts was also to demand that the British government give him its so-called information regarding IRA conspiracies (information that was actually false) and this was not received. The two main things to take into consideration here, I would suggest, is a) the problem of financing the army (if the people who have the gold make the rules, and the Dail had little money, there is the issue of why the powers-that-be did not finance the Dail’s desire to institute an army and police and, indeed, could not really be said to have done that until the autumn of 1922 (after Griffith and Collins were dead). If that money was given earlier, the army unity negotiations may have worked. Also, b) the propaganda war in the press (from all sides, including the British press in Ireland). If you consider that no records of the time period were made available to the public until the 1990s, the only way people had of understanding what happened at that time, until quite recently, was a) newspapers, and b) people’s sense of the time from a combination of communal &/or family memories and oral history, often based purely upon the locality in which they lived, as well as a very personal interpretation of the lives of individuals, rather than a national, or governmental, perspective (how many people in Limerick, for instance, knew or could know what the Dail cabinet was thinking at the time?). Also, before those records were made available in the 1990s, many books (and newspaper articles) were written on the subject and yet they could only be based on very shaky sources (personal memories, primarily). That is a potential difficulty for historians, because for 75 years people in Ireland had a strong sense of “civil war politics” that was based largely on their own passions (or party politics), not historical records, which have only recently been made available, and consequently it is now difficult for a lot of people to see the “wood from the trees” regarding that time period because they feel they know what happened already and so interpret new research findings in that light. I would say the issue here is not “reinterpreting what happened at that time” so much as “beginning to understand what happened at that time”. A point that people did understand at the time, and which is connected to your perspective on Griffith, is the point of authority over the army. Keeping that with the Dail was essential to its survival, as far as Griffith was concerned, and I think that was not only understandable but also central to the army unity negotiations. If one considers that a) in 1918 Sinn Fein TDs abstained from Westminster to form the Dail, and b) in 1922 half of Sinn Fein TDs abstained from the Dail to no constructive end, the latter development essentially occurred in September 1922 and may not have happened if Griffith’s perspective on the army unity negotiations had worked. If one is interested in Griffith as a biographical subject, that perspective is one that needs to be recognised and not one that is discarded because of a personal sense of what should have happened at that time or rather what individuals were ‘on the right side’. If you do more detailed research on the IRA situation in 1922 and the joint conferences held (evidently under IRB auspices), I think you will find that the two key “framework of interpretation” issues are a) Liam Lynch’s willingness to consider, although great anxiety and uncertainty in considering, reasserting the Irish Volunteers independence from the Dail; and b) Richard Mulcahy’s belief that Sinn Fein Party unity was the best means of preserving Irish Volunteer/IRA unity. How those two specific ideas and, in particular, their practical consequences, affected what happened could, in time, provide an interpretative framework that accommodates understanding of all sides at that time. You may disagree, but I think that would be a good development in terms of historical studies on that subject. If you even take what some may have considered as the most prominent anti-treaty text in terms of oral history, Florence O’Donoghue’s No Other Law, he is attempting to answer such questions. The good thing “today” is that we have the historical records available that may enable us to do so; something that O’Donoghue did not have (e.g. GHQ or Dail cabinet sources) in 1954. All he had was his memory of the individuals he knew, including Lynch who, I think (but am not 100% sure), O’Donoghue was responsible for swearing into the IRB in Fermoy during 1917 and, consequently, perhaps knew him better than anyone. Interesting, perhaps. To David Flood: you have a lot of interesting detail there. 1) As regarding Stritch, I was not aware of his management of the old National Club site (41 Rutland/Parnell Square) so much as the issue that, by 1912, his name surfaces quite a lot in the newspapers alongside Clarke (secretly IRB treasurer) as the manager of the Wolfe Tone Memorial Committee which, like most IRB-associated clubs post-1887, usually met at 41 Rutland Square. For that very reason, you may well be right regarding how Stritch became involved in the rising. Frankly, I was not aware of volunteers mobilising under a J.R. Reynolds at 41 Parnell Square on Easter Monday. If you continue with that line of research, you may well be able to unearth new details regarding “just how exactly the IRB tried to get people involved in the rising” that are all your own original work, so good luck with that. 2) I heard from talking to the widow of Fred Allan’s grandson that he always refused to speak to anybody in detail regarding his IRB career when questioned about it in the ten-to-fifteen-years before his death (1922-1937). That fits with the point you made regarding some ex-IRB figures attitude to the BMH. Allan’s “papers” in the NLI are actually John McBride papers that were in Allan’s home. Re. 1916, the story I heard and that Allan’s grandson, Sean Allan, tried writing about, is that on Easter Monday, when McBride heard of the rising breaking out, he decided that he should join. Allan, with whom McBride lived, said to him “I don’t think you should”. And that’s it. In other words, McBride’s involvement in the rising was voluntary and personal and began on the Tuesday (he just turned up and joined in, I think with Ceannt’s group). I’m curious about your reference to BMH statements – I have not seen the ones such as described (yet?) – about Allan’s association with either the National or Irish Volunteers, because I’ve never seen records to indicate that he had a connection with either. My sense of his career is that he left the IRB for good in 1912, but he naturally still knew many of its members and it was because McBride was executed in the rising that he felt the inclination, or responsibility, to get involved in the Irish National Aid Association and Volunteer Dependents Fund in 1916, of which he became the principal administrator in Dublin up until June 1917. I would be inclined to judge (or suspect) that the information you site from BMH statements re. Allan/MacBride is incorrect “in fact” – it will have been based upon personal impressions and hearsay at the time (i.e. oral history) – but may be said to be correct “in impression” specifically on the issue of an association of Ceannt with the people connected. Remember too that Ceannt was the leader of the South Dock Union in Dublin and so, rebellion or no rebellion, naturally had an association with various people in some way connected with municipal politics in Dublin. 3) The Sheehan brothers story is interesting (I did not actually know of it before) but, I would expect, is in no way as significant as you suspect. If you consider the story regarding McBride, or even stories regarding Pearse’s feelings in the GPO, I think it would be fair to say that the rising was considered to be an effort at a “grand gesture” that even those involved in had mixed feelings about, precisely because they were taking such a huge gamble and they did not know what its result might be. Everyone would have had “butterflies”. Also, consider when you speak of “the military prospects of the rising” the fact that the rising itself involved the taking over of public buildings and then manning those barricades. Aside from the act of taking over the public buildings (& attempting to severe connections or link roads), it was not actually an offensive, or military, act. Instead it was a quintessentially republican style rebellion (in the European sense) of proclaiming an ideal and then, in defending the barricades, associating those who attacked them with an attempt to supress that same ideal and so potentially popularising the same. As a signing off and potentially shocking remark, a point regarding the history of that era that I think deserves to be considered more by Irish historians is the War of Independence itself. In Dail statements and some sympathetic press statements at the time, the comment was often made “when will this English war against the democratic will of the Irish people end?”. In other words, it was the English who were taking an offensive against the Irish rather than vice versa. Those who stood by the Dail were both proclaiming an ideal and in taking over from the RIC etc. in the provinces “proving” that the Irish really wanted to govern themselves. A terminology that Mulcahy used on occasion, which was unfamiliar to me, was an “IRP”, which, it seems, meant an Irish republican police. If one considers that (almost) all the outrages committed 1919-1921 involved the willingness of some of the RIC not to surrender control of policing to the Dail, then an IRP terminology is as appropriate, or perhaps even more appropriate, terminology to an IRA one in terms of understanding what was going on in a supposedly “military sense” (and, remember, the RIC were a military-governed force: hence the ‘auxiliaries’ methods). However, once the Dail was in a position in 1922 to cement its authority (with, potentially, no British right to prevent that), the issue had really arisen for the first time to create an Irish republican (with a small r, admittedly) army, not just an Irish republican police, as the only recognised forces of the law of the land. That is “one reason”, apart from the most critical one of all (setting up a government requires recognition of a right to the public purse), why I think the Irish revolution could really be dated from 1919-1927 more so than anything else. The many narratives of “the Irish Revolution 1912-1923” and many histories written by British historians of “the Irish War of Independence 1919-1921” that constitute almost the only narrative of the history of the time to date, before comprehensive study can be done by scholars on the records beginning to be released ever since the 1990s, just “may” have prevented many from getting as good a perspective as could be done as to what not only what the Dail was all about but also about what the Irish Volunteers were fighting for. If you read between the lines, I think that perspective becomes evident even in many of the “personal memoirs” of the time that are surfacing, through the BMH or otherwise. Owen, sorry but you’re quite wrong about Griffith’s role in the Civil War. Documents from both the Mulcahy papers (which I’ll cite if you’d like) and elsewhere including for instance Ernest Blythe’s recollections show that Griffith was not in favour of conciliating the anti-Treatyites in the first six months of early 1922, unlike Collins and to a degree Mulcahy. Second, Griffith himself drafted the notice for the attack on the Four Courts and third Griffith formally rejected peace overtures after the Four Courts attack from the Labour Party, the Catholic archbishop of Dublin and others. The other point is that the army unity negotiations were not primarily about pay for the anti-Treaty IRA, this was a subsidiary concern. They were about whether the Treaty could be re-negotiated as the anti-Treaty Executive insisted. I I would respectfully suggest that it is you who are not seeing the wood for the trees here. Re the IRP, rival police forces is part of the story of 1919-1922, but the IRP was a separate non-combat arm of the IRA whose job was to prevent and punish ‘ordinary’ crime and to enforce the rulings of the Dail Courts. Its mission was quite different from the basically military objectives the IRA set itself – which were attacking state forces. Though the lines between the two sometimes blurred, they were not the same thing. It was not just a difference in terminology. THE IRA saw itself as an army and, had the Treaty split not occurred, would have been absorbed into the new state’s army in early 1922 – as the pro-Treaty elements of it indeed were. And separately of course a new police force the Civic Guard was also gradually constructed. To Gerard Shannon: can I suggest you consider this? You say “the Dail stopped meeting as a separate cabinet to the PG”. Well, Dail cabinet minutes survive, believe it or not, and it was the Provisional Government that stopped meeting. Also, what was the Provisional Government except an instrument for the transfer of powers? To John Dorney: can I suggest you consider this? 1) What was the ‘anti-treaty executive’? And when is it supposed to have come into being? 2) local courts utilise police, not armies (armies are a cabinet prerogative; hence the Dail’s attempt to regulate its own army); 3) what was the treaty split if not a party-political split if the Dail was the government? And if so, how is that that may have affected army unity? 4) You say Griffith rejected ‘peace overtures…from the Labour Party, the Catholic archbishop of Dublin and others’: do you honestly think Griffith had declared a ‘war’ on these bodies? There are different perspectives here, and I don’t deny that Griffith was forced into consenting to a firing on the Four Courts. But that event was not “the” basis of all political events of the time. Why, for instance, was it expected that the entire Dail could reconvene again within a month? The two “sides” were not poles apart (then). I believe that is true, and if it wasn’t for the prolongation of the conflict it might have ended soon (I think it was Liam Lynch who said ‘all this should never have happened’). Maybe, as you say, I am not quite seeing the wood from the trees here (that’s bound to be true of me as of every individual to some extent) but I don’t think the civil war should be seen as the prism through which the entire history of the period should be viewed. And I don’t think you are right about Griffith’s attitudes towards the preservation of the Dail and ‘the army’. As to Blythe and Mulcahy, I have seen their papers and they could be made the subject of biographies in their own right. I’ll leave it at that, ok? I’ve written a biography of Griffith. You are free to attempt to do so yourself someday. There are only thirty years of sources and newspaper articles to read and study on the matter. If you attempt it, it may well include a very different perspective. Judging by your comments here, you may be already disposed to offering such a very different perspective. Or perhaps not. I’ll have to focus on other things now. I hope you find at least “some” of my comments interesting and, in particular, the Griffith biography, which was the fruit of a lot of hard, unsalaried work and was written without preconceptions and an honest attempt to understand things as best as I could. And it covers his entire career. I guess that is why I felt inclined to respond to a suggestion here that he as a subject is in some way “absent” from the text, as I felt I made him central to the text and even did a particularly good job in doing so! But anyway…. And…that’s the end of my contribution to this ‘Irish Story’ debate! (1) the anti-treaty IRA Executive came into existence on March 26 1922 at the IRA convention at the Mansion House Dublin, when the anti-Treaty IRA repudiated the Dail’s authority over the army. (2) I do not see what point you are making. The underground Dail of 1919-22 had both police – IRP – and army – IRA. (3) There were two parallel Treaty splits. One was the political one in the Dail. The really serious one was the Army split, which occurred at the IRA Convention March 25-26 1922. At this point the anti-Treatyites in the IRA rejected both the Dail and the previous IRA GHQ and vested their leadership in the Executive they elected. (4) I did not say that. What I said was that those bodies came to Griffith appealing for a truce on June 28 and were rebuffed. The two sides might have been reconciled? Absolutely. No arguments there. It was contingency and British pressure that caused the final break. But Griffith unlike Collins and Mulcahy wanted a break much earlier with the ‘mutineers’. I would also argue that the Four Courts attack was the point of no return. After that the anti-Treatyites were united on the basis -they believed – of defence of the Republic against British backed ‘Free Staters’ and the pro-Treatyites were united on the basis that they represented the legitimate government and the will of the people’. Should Griffith’s entire legacy be judged on the last 8 months of his life? Of course not, I agree with you. But to say he had nothing to do with the civil war is just not right. All the best to you Owen. Writing a book is hard work and it is much easier to criticise it afterwards.